You’ve created your new ASP.NET Core web app and are happily building your features. Then something breaks and you’ve no idea what. How can you find out what’s causing the problem? If you’ve created your ASP.NET Core web app from scratch (not using any templates or magic but bare-bones style using dotnet new) then you’ll find you have absolutely no error handling/logging set up. This makes diagnosing errors pretty difficult. ASP.NET Core uses middleware to configure your application. You’ll use middleware to configure things like authentication, error handling and logging. Add logging middleware to see what (if any) errors are being reported by your application. Don’t forget to select the .NET Core SDK version you’re using before you follow along. Let’s start with logging to the console. Add a couple of dependencies to project.json. Make sure to restore them. Update Startup.cs to add the Console logger (via loggerFactory). Now the console will show you what’s going on “under the hood”. In this example .NET Core can’t find a specific view. Microsoft.Extensions.Logging is a new common logging subsystem that makes it possible to use the same logging code but target different log providers. Microsoft provide some basic loggers in Microsoft.Extensions. For example you can write to the Event Log. As you can see, there is one for Slack. This is not provided by Microsoft (note the different icon). You can bring in third party loggers as dependencies (or write your own). Here are some popular ones. 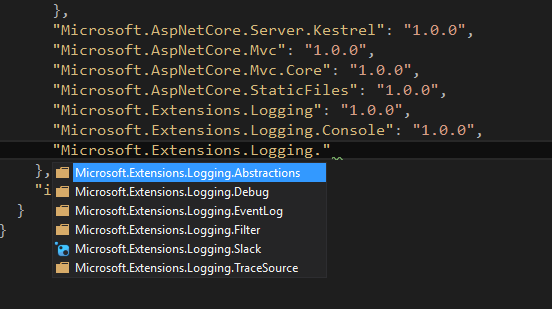 This is just the tip of the iceberg when it comes to logging in ASP.NET Core. Next we’ll take a look at logging your own messages and how to log different levels (e.g. info/debug) depending on your environment. All posts in the ASP.NET Core from scratch using the command line series.